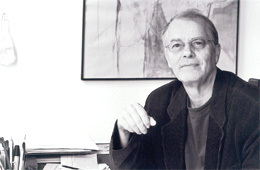 Born in Dresden in 1939, Volker Braun is considered one of the most important dramatists from the GDR. His oeuvre includes poetry, drama, radio plays, novels, and short stories. As a student of Philosophy at the University of Leipzig in the early 1960s, Braun began his literary career as an avowedly political writer in the tradition of Bertolt Brecht. From 1965-67 Braun worked for the Berliner Ensemble. After the Prague Spring of 1968, Braun became increasingly critical of the Socialist regime and was subsequently closely monitored by the Stasi. Nevertheless, he received several prestigious awards, including the Lessing Prize of East Germany in 1981 and the National Prize of the GDR in 1988.